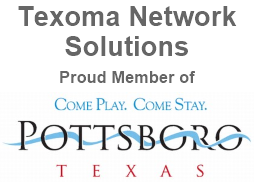 Texoma Network Solutions offers security setup for firewalls, routers and access points for both wired and wireless networks. You can never be too careful with security. Without the proper steps, some or all of your data on site and what is being transmitted can be vulnerable to peeping eyes. We are here to help ensure that this does not happen. By implementing limited access to the network and encrypting connections, along with other security measures, you have a much better chance of surviving an attack on your network. Attacks can come from inside or outside of the network and this needs to be addressed at every customer's location before it is too late. Better safe than sorry. 90 day warranty on all parts and accessories. All labor charges are final. Extended warranties available. Cost of parts may be required up front. A 20% restock fee of the retail price of the parts may be deducted from deposit if repair/order is cancelled.